How do I view source in Outlook 2010? This question has already been asked here; but the answer only gives advice on how to view the email header not the actual html source of the email. If I right click on the bottom of an email I can see the option to 'view source' but when I select it nothing happens. I have done a bit of research and came across a post for a much earlier version of Outlook that suggested adding something into the registry. I applied this advice, but it made no difference; but I'm pretty sure that applying this solution correctly for my circumstances will do the trick. When I first received this machine it had a demo version of UltraEdit installed. I uninstalled UltraEdit and installed Notepad++ instead. I am convinced that there is a registry entry that is pointing to UltraEdit as the default view for 'view source' in my email and I need to replace this entry with a reference to Notepad or Notepad++, but I don't know how to do this. Select "View Source" in and drop it in a new Group. It invokes Notepad and shows the full html source. Double click on the mail, this will open it in a new window. After that, then click on File > Properties. You will be able to see the header information from there. For the "view source", right clicking on mails that have a source will by default open it in notepad. For mails that aren't formatted (in HTML etc), the "view source" option will be greyed out. Now you have an icon to always view the source no matter what kind of email. I have this issue also. I am sure headers and source were available for most (if not all) messages I received when running Outlook 2007, now it seems to be the exception to the rule. I have found http://email.about.com/od/outlooktips/qt/How_to_View_the_Complete_Message_Source_in_Outlook.htm that I have only just implemented, so can't say for sure if it will solve the issue for new e-mails. Be sure to double click on the message to open it separately and that you are not looking at it in the preview pane. If you single click and the message shows below or to the right of the email list you are in the preview pane. You cannot select view source in the preview pane. Once you have opened it separately, you should be able to select view source. I had this problem and solved by opening the email and not just previewing it. 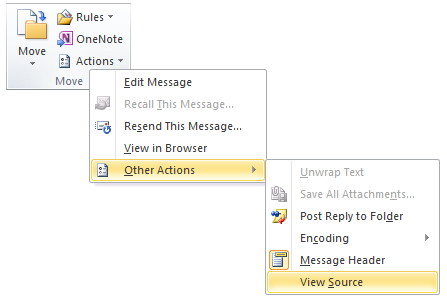 In the latest version of Outlook you right click in the email and choose: view source. For plain text mail, it is impossible to "view source" and hence view source option is greyed out. To get full header and source for plain text mail, convert to eml file by using third-party tools such as Super User: OutlookMessagesExportEML. There is a command view source... in outlook 2010 (office home and business) version 14.0.61.49. Not the answer you're looking for? Browse other questions tagged microsoft-outlook-2010 or ask your own question. How to save a mail into an .eml-file with Outlook? How to change the default program used by Outlook 2010 for displaying the source of an email? Is it possible to redirect Outlook 2010 to Gmail?